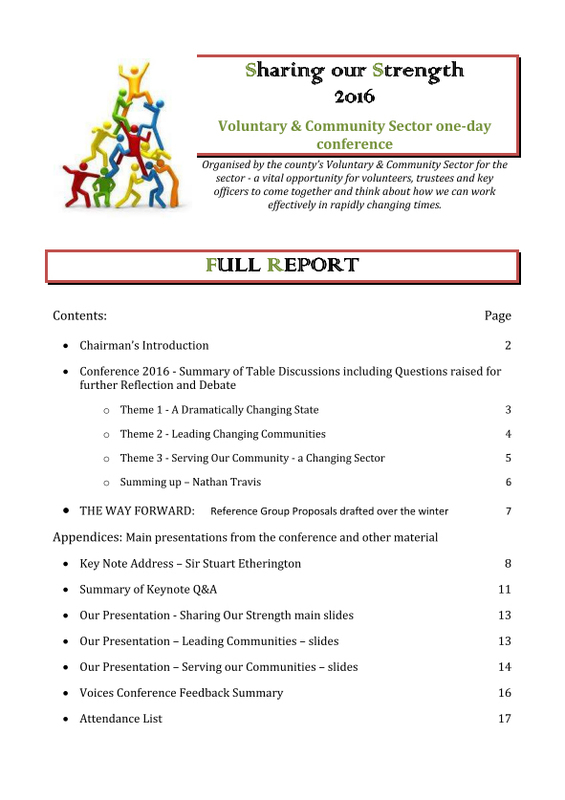 Our conference was entitled Sharing Our Strength and drew on the national, county-wide and local voluntary sector itself, including, of course all who participated in the day. We were challenged by the rate of change of the world around us, but, rather than being daunted by the traditional complaints of funding cuts, we set out to look at ourselves, our values, traditions and agendas to ask if we are “fit for purpose”. Despite some assertions at the conference to the contrary the picture of Britain is one of a nation committed to mutual care and to volunteering, so if we have lost the plot there will be waste and inefficiencies in our organisations, reducing our effectiveness for those we aim to serve. In the course of the day there was much frankness and heart searching, but also the encouragement and hard work of the type on which our nation’s culture is built. We needed to take stock; this was not a conference to provide answers as some would have liked; it was a time for resetting and recommitting and we were much encouraged by people’s obvious enthusiasm albeit alongside their trepidation at the task.